Meteor iPad DAW now offers users 16 – 24 Tracks[/caption]Meteor Multitrack DAW (Digital Audio Workshop) for iPad lastest update has increased the number of tracks available from 12 to 16 and upto 24 through and In-App Purchase. The additional tracks and the functionality such as MIDI Inport/Export, MIDI Clock Sync and SSP, Virtual Instruments and Free Sound Library put it on a par with what users would expect from vastly more expensive software. Increased default number of tracks from 12 to 16 and added the ability to extend it to 24 via an In-App purchase. Added Replicate function to popup menu for duplicating large sections of a song. Added ability to override MIDI port in prefs so a track can specify it’s own MIDI port or applications virtual MIDI port. Added Auto Quantise feature to MIDI editor. You can now quantise MIDI notes as they are recorded. 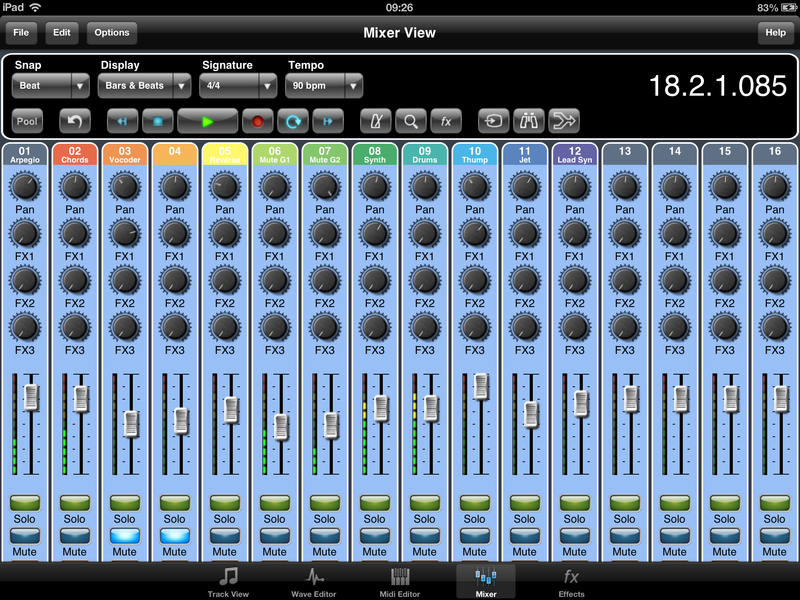 Redesigned the mixer screen to handle more tracks and better landscape viewing. Added support for Channel Pressure for MIDI instruments. Major optimisation of audio mixing engine for better low latency support. Increased the render speed of audio clips in view mode and the mixer display. Added a note stealing algorithm to the Sampler instrument for better handling of large polyphony. Virtual ports created by other iOS applications now show up correctly. Fixed a bug which caused clicking on clips that use the Cross Fade function with EQ enabled. Added the ability to change the volume level of an imported video clip. Fixed a possible crash when mixing down to a stereo track with ‘Remove existing parts on ALL tracks’ checked. Fixed the broken MIDI loop recording. Fixed a bug with MIDI step recording using the virtual keyboard. Creating a new project now clears previous track EQ settings from mixer.